High quality copy of the original Omega instruction manual for B-7 autofocus condenser enlargers. This reproduction has been enlarged slightly from the original size for greater clarity. Our B-7 manual includes a parts list. 5½" x 8½" format. Staple bound. 16 pages. Parts list is in 8½" x 11" format. 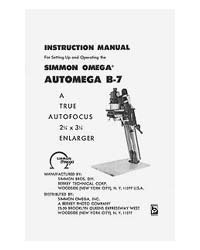 Home Instruction Manuals Omega Instruction Manuals Omega Enlarger Manuals Omega B-7 Automega B7 Enlarger Instruction Manual with parts list.